The stalwart figure of William Wallace bestrides the pages of Scottish history like a colossus. The inspirational Scots patriot was the second of three sons of Malcolm Wallace, a landholder of Elderslie near Paisley and Margaret Crauford. William's birthdate is a matter of dispute all that can that can be said with certainty is that it occured around 1270 - 1276. He was educated by his uncle, who may have been a parson, at Dunipace, in Stirlingshire. His father had refused to pay homage to the English king, Edward I. Malcolm descended from Richard Wallace, of Welsh extraction, who had followed the Stewart family to Scotland in the twelfth century. The surname Wallace is purported to mean Welsh, or possibly 'foreigner'. Malcolm Wallace was killed at Loudon Hill in the latter months of 1291 by an English knight named Fenwick. William himself was declared an outlaw when he killed an Englishman named Selby, who had insulted him. He later killed two English soldiers in a fracas over poaching fish. Following the extinction in the male line of the ruling House of Dunkeld, when Alexander III inadvertantly tumbled over a cliff on a stormy night in 1286 , and the death of his only grand-daughter, the six year old Margaret, the 'Maid of Norway', Scotland was left without a monarch with no clear successor and a number of contenders vied for the honour. The formidable King Edward I of England was asked to arbitrate and his choice fell upon John Balliol (1248-c.1315), who was set up as a puppet king, with himself pulling the strings. The slighted Bruces, who had been amongst the contenders, defiantly refused to pay homage to King John. The opportune Edward I had hoped to personally gain by his involvement in Scottish affairs and in 1293 he declared the treaty of Birgham void, rendering his puppet, King John, known as Tom Tabard (i.e. empty garment) with little actual power. Edward, incensed, marched into Scotland at the head of an army. Balliol was taken prisoner to England, English overlords were appointed to govern Scotland. The Stone of Destiny, on which Scottish kings were traditionally crowned, was carried off and placed in Westminster Abbey, where Edward humiliatingly had it incorporated beneath the English throne. 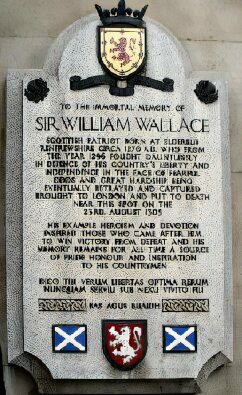 Wallace emerged from the shadows of obscurity to carry the torch of Scottish independence in May, 1297, when he rose against William Hazelrigg, the English sheriff of Clydesdale and slew him. He was a powerful man of sturdy physique , whose height was reported to be 6'7". No contemporary portraits exist although he was described in the Scotichronicon, dating from from the fourteenth century as " a tall man with the body of a giant, cheerful in appearance with agreeable features, broad-shouldered and big-boned, with belly in proportion and lengthy flanks, pleasing in appearance but with a wild look, broad in the hips, with strong arms and legs, a most spirited fighting-man, with all his limbs very strong and firm." The effect upon the subjugated Scots was electric and supporters flocked to Wallace's cause. 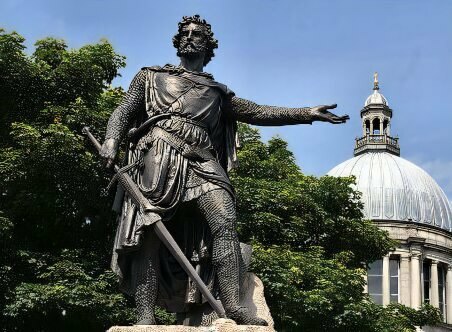 Heading a rebellion in the name of King John Balliol, he succeeded in driving the English out of Perth, Stirling and Lanarkshire and laid seige to the castles of Stirling and Dundee. Andrew Moray rose simultaneously in the north, from Avoch in the Black Isle, he took Inverness and Urquhart Castle by Loch Ness. Although Wallace gained the support of the Scottish clans, he never succeeded in gaining the loyalty of the nobles. Bringing new hope to a nation staring into the abyss, with infectious courage, he defeated the English under John de Warenne, Earl of Surrey at the Battle of Stirling Bridge. Warenne offered to negotiate, urging Wallace to accept the king's peace, this was proudly rebuffed 'Tell your people that we have not come here to gain peace, but are prepared for battle, to avenge and deliver our country. Let them come up when they like, and they will find us ready to meet them even to their beards.' Wallace gained victory over the English despite being less well equipped and far outnumbered, forces lead by Wallace and Andrew Moray used clever military tactics to rout the English, and clearly exhibited to the Scots nation that the English were not invincible. Murray, however paid a heavy price, he was badly wounded and died as a result of his injuries two months later. After Stirling Bridge, Wallace was knighted, possibly by Robert the Bruce. Wallace was appointed Guardian of Scotland, to rule in the name of the captive King John. He evoked much love and reverence from the common people who saw him as their champion and protector against English oppression. He proceeded to ravage and pillage the Northern counties of England. On 22nd July, 1298, Wallace experienced the bitter taste of defeat at Battle of Falkirk by an English army led by Edward I in person, who was eager for revenge. The English longbow wreaked havoc among the Scottish ranks, Scots casualties were great and Wallace himself was forced to flee to the mountains. With unbending commitment to the cause of Scotland's independence, he continued a guerilla war until 1299, taking refuge in the Scottish mountains and forests, after which when he went to France in an unsuccessful attempt to obtain foreign aid. The guardianship of Scotland passed jointly to Robert the Bruce , the Bishop of St. Andrews and John Comyn, Lord of Badenoch, known as the 'Red Comyn', the nephew of John Balliol and already an enemy of the Bruces. Bruce and Comyn quarreled frequently, Bruce was reluctant to fight to support Balliol's claim and eventually resigned his commision. The spirited William Wallace, unbowed, returned to Scotland in 1303 and resumed guerilla attacks in his struggle against the English. On 5th August, 1305, in an attempt to meet up with Robert the Bruce, he was treacherously betrayed by Sir John de Menteith, a fellow Scot and captured by the English in a barn at Robroyston near Glasgow. Menteith had fought on the Scottish side in the Wars of Independence but had later sworn allegiance to and made his peace with Edward I. Edward rewarded him by appointing him sheriff and keeper of Dumbarton Castle. Wallace was taken captive to London and put on trial at Westminster Hall for treason against Edward I, although he had never sworn fealty to him. Wallace was subjected to an appalling and barbaric death, he was dragged on a hurdle from Westminster to the Tower of London and on to the Elms at Smithfield, where he was hanged, drawn and emasculated, his entrails being burned before his eyes. His decapitated head was set upon a pike at London Bridge, while his quartered body was exposed at Newcastle, Berwick, Perth and Aberdeen. William Wallace remains a national hero amongst the Scottish people. 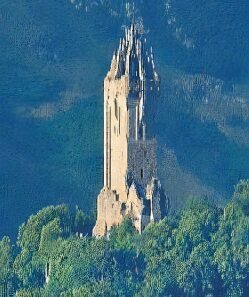 The towering mock gothic Wallace Monument at Abbey Craig, a mile to the north east of Stirling was erected in his memory in 1869 by public subscription and overlooks the site of his famous victory at Stirling Bridge. It contains what is reputed to be his 5' 4" (162cm) long sword.